This CellML model runs in OpenCell (but not in COR due to the presence of differential algebraic equations - or "circular equations"). The units have been checked and they are consistent. The model does not replicate the published results (we have added 5mM of external glucose at 60 seconds but this does not cause the ATP concetration to increase. The original CellML model was based on equations published in the supplementary material in PNAS but this is no longer available online. We have tried to contact the authors and the journal but 10 years on they were unable to locate the missing material. ABSTRACT: Unlike in other organisms, in trypanosomes and other Kinetoplastida the larger part of glycolysis takes place in a specialized organelle, called the glycosome. At present it is impossible to remove the glycosome without changing much of the rest of the cell. It would seem impossible, therefore, to assess the metabolic consequences of this compartmentation. Therefore, we here develop a computer experimentation approach, which we call computational cell biology. A validated molecular kinetic computer replica was built of glycolysis in the parasite Trypanosoma brucei. Removing the glycosome membrane in that replica had little effect on the steady-state flux, which argues against the prevalent speculation that glycosomes serve to increase flux by concentrating the enzymes. Removal of the membrane did cause (i) the sugar phosphates to rise to unphysiologically high levels, which must have pathological effects, and (ii) a failure to recover from glucose deprivation. 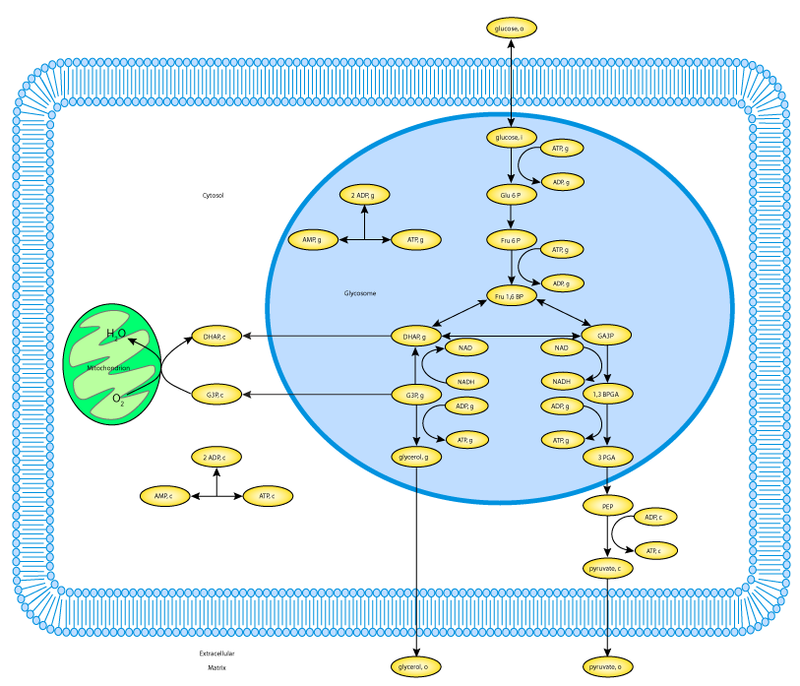 We explain these effects on the basis of the biochemical organization of the glycosome. We conclude (i) that the glycosome protects trypanosomes from the negative side effects of the "turbo" structure of glycolysis and (ii) that computer experimentation based on solid molecular data is a powerful tool to address questions that are not, or not yet, accessible to experimentation. A scheme of glycolysis in the bloodstream form of the parasite Trypanosoma brucei. In the model described here, the glycosome is absent. Derived from workspace Bakker, Mensonides, Teusink, Vanhoek, Michels, Westerhoff, 2000 at changeset f19dbed3b2aa.